« Recycle Santa Fe Art Festival – 20th anniversary! Southwest CARE Center and The Envision Fund invite you to join them at the annual AID & Comfort event on World AIDS day to raise awareness and garner support for those living with HIV, and demonstrate our commitment to ending HIV and AIDS. 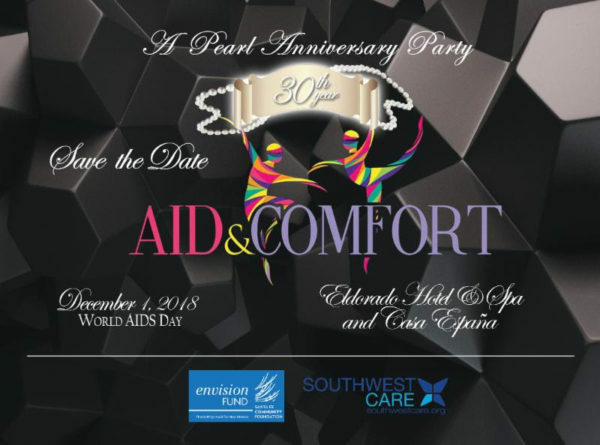 The 30th annual AID & Comfort event is happening on December 1st—World AIDS Day—at the Eldorado Hotel and Spa’s beautiful Casa España. AID & Comfort has been Santa Fe’s signature event for supporting people living with, or affected by HIV/AIDS and each of you has, in one way or another, been a participant in its success over the years. With a clear emphasis on the future, Southwest CARE Center and the Envision Fund have decided on a mutual goal: reducing new HIV infections to zero here in New Mexico. Yes, it is ambitious to imagine a generation free from HIV/AIDS. Nevertheless, we feel that we can make this goal a reality—because of so many advances in the prevention and treatment of HIV. We hope you will join us in the pursuit and achievement of this historic goal. More details about the event, as well as ticket and sponsorship information are available on our website. Please join us again this year for what promises to be a wonderful evening in celebration of our successes and our efforts toward continued progress in this important work.